Are you ready to take your principalship to the next level? EducationHall Executive Director Pete Hall is now offering 1:1 principal mentoring/coaching support for administrators in all stages of their professional journey. Pete served 12 years as a principal in three schools, earning multiple honors as a leadership expert and turnaround specialist. Trained and certificated through the NAESP National Principals Mentoring Certification Program (and subsequently serving as a trainer in that program), Pete has effectively mentored principals, assistant principals, aspiring principals, and district-level administrators across the country – and internationally – since 2004. 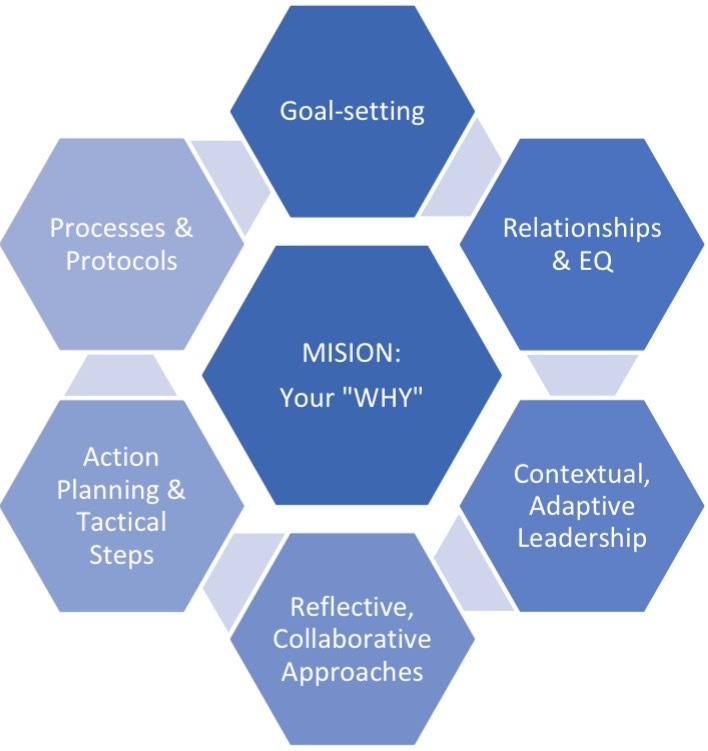 What is the goal of principal mentoring? Quite simply, Pete will partner with you to help you achieve your goal, whatever that may be. The scope, content, and outcomes are determined by you. That said, the emphasis in this partnership is on building your leadership capacity. Equipping leaders with the requisite skills, reflective habits, and courageous dispositions to positively impact learning and teaching within the schoolhouse is the focus. Your needs drive the specific mentoring relationship. What Theory of Action inspires this mentoring? Research on professional/leadership mentoring reports higher job satisfaction, greater sense of efficacy, stronger relationships, increased performance, better retention, and a host of other positive outcomes (The Education Alliance at Brown University, 2003; Wallace Foundation, 2007; National Association of Elementary School Principals, 2017). IF you partner with a qualified mentor in a strategic, differentiated, ongoing, job-embedded partnership, THEN you’re more likely to achieve your goals and grow as a leader. What will the mentoring partnership look like? Pete will sit down with you to discuss your goals, your “mision” (the place where your mission – what drives you – and your vision – what it looks like in your ideal future – intersect), and your definition of success. Then you’ll craft a tactical plan for achieving your goals and growing as a reflective – and effective – leader. Over the course of the mentoring period, you’ll communicate, collaborate, reflect, and revise your approaches to remain calibrated towards your goals. Pete will provide tailored support to challenge and extend your thinking about your responsibilities, matching his support with your needs. What is on the Menu of Mentoring Services? On-site visits (minimum 3 per year, fall-winter-spring – or choose the deluxe monthly-visit package to truly go deeper and accelerate your growth as a leader): Pete will spend the day with you on your campus, engaging in discussions and activities designed collaboratively to support your growth. Visit classrooms, debrief feedback, brainstorm, analyze data, process scenarios, set goals, revise action plans, participate in team meetings, examine a problem-of-practice, you name it. Phone calls (at least 1 per month, recommended): These calls provide an opportunity for you to update and/or refine your goals and action plans, reflect, debrief your leadership moves, and discuss the goings-on at your building. The amount of time is determined by you and your needs, from 2 minutes to an hour, as often as you need to connect. Email & text connect (Unlimited): Need we say more? Pete’s usual response time is 24 hours for an email; even less for a text. Others (TBD by mentor & mentee, depending on what’s necessary to achieve the goal). This is a partnership designed to support your growth as a leader – with success defined collaboratively – so if there’s something special you’ll need to proceed, you and Pete can work it out together.